I wonder if that was hard for the game developers and publishers to come up with another idea for the sixth part of the game. Cake Mania: To the Max takes on time-travelling theme again, but don't think that it will be boring. This time you go bake into 1980's. 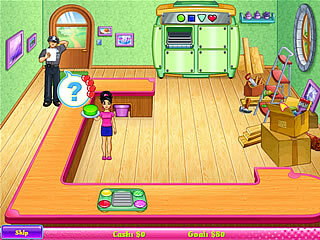 You'll stay in one bakery for 100 levels in one of the two modes - Timed or Relaxed, depending on your taskes and skills. The question that pops up in your mind must be "What was in the 1980's ?". Well I will gladly let you know. Those are the times of Jill's high school era. So we are moving back and forth within the story of one character just like in a good epic. This time things are going to happen in one bakery instead of a series of shops. Some will surely say that this is a boredom provoking feature, but I'm sure there will be others, who will appreciate this focus on one place. You'll stay there for 100 levels in one of the two modes - Timed or Relaxed, depending on your taskes and skills. All of the work here will be around baking. Your major responcibilities will be baking cakes ordered by your customers by clicking shapes, frostings in different colors, varying toppings or fruits. Things get started very easy and slow, but don't be misgueded into thinking that this is how it is going to be till the end. 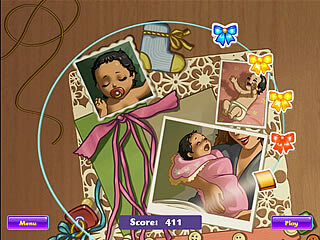 Apart from the growing difficulty level, complexity of all of these cakes, there are also different characters in the game, whose special characteristics influence the gameplay. Some of them are really interesting and funny. For example, the wizard can turn everybody into cheerleaders, which changes their orders too. And the oil baron won't let any other customers be served before him. Another new feature of the game comes in handy when you find out that some of the customers don't like each other. In those cases you can swap them and put into different places. There is also a rush bonus that was in the previous releases, that is very helpful in a hectic game like this. The upgrades system is more polished now. Apart from the usual upgrades of machines or toppings, you can now invest into the interior of the bakery. That makes a lot of sense since you are staying in this place for the whole game, right? The graphics and music are just perfectly cute and smoth creating this bright cartoon world. 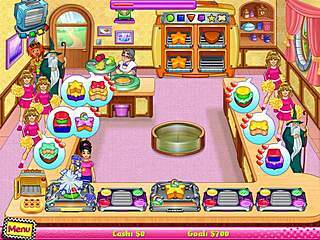 This is Cake Mania: To the Max review. Download this game here.